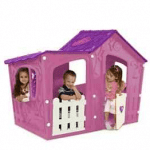 Kids playhouses - Who Has The Best Kids Playhouses? 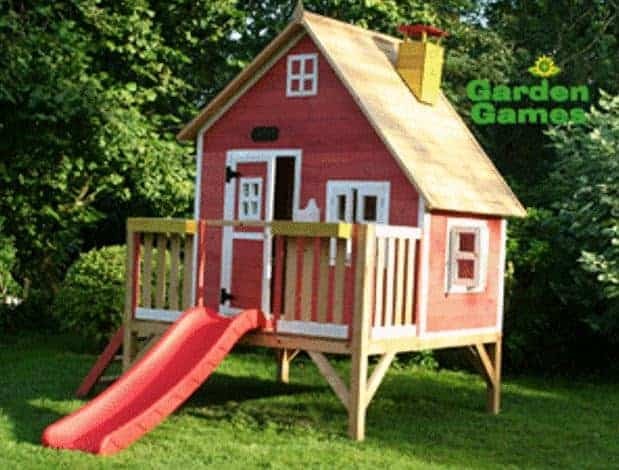 Kids playhouses bring a dash of colour and excitement to the garden, and if you have young children or grandchildren they can be a perfect purchase. Not only do they provide a safe environment in which they can burn off all that excess energy they have, they can also encourage the development of their imaginative and social skills that will come in so useful in later life, as well as helping them keep fit. Of course, the bottom line is that they’re lots of fun. The only difficulty can be in finding the playhouse that’s ideal for your garden and your little ones, which is why WhatShed have created this handy guide to the very best kids playhouses that can be bought online in the UK today. When researching kids playhouses, we were pleased to find fifteen very high quality examples deserving of a place in our league table. We then ranked them by looking at their price, and overall value for money, as well as their looks, design quality, any value adding features they had, and their overall fun factor. We’ve reviewed playhouses in all kinds of forms, so how did we differentiate kids playhouses from toddler playhouses and garden playhouses that feature in their own WhatShed league tables? Kids playhouses should appeal to slightly older children, so it’s fine for them to be on two levels. 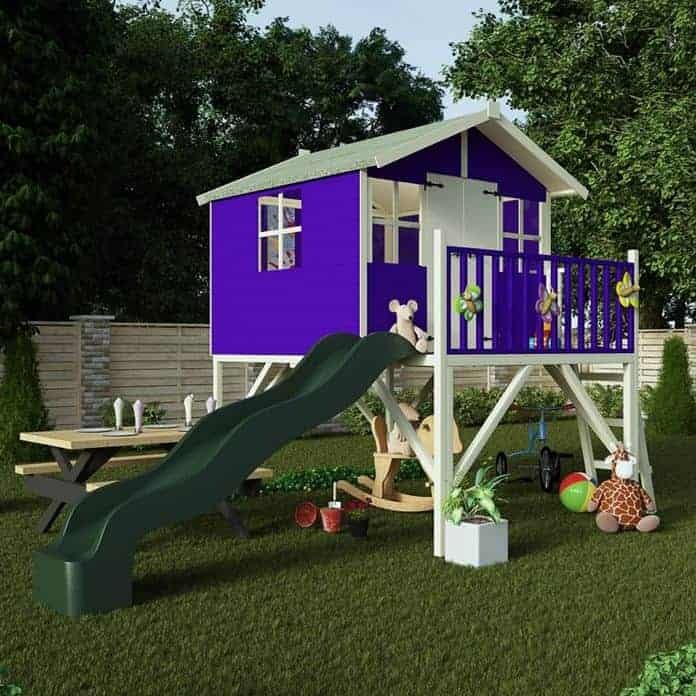 We also felt that additional fun features, such as slides and swings, epitomise kids playhouses, as well as fun and bright colour schemes, and designs that are built for play rather than following traditional garden building designs. In a very competitive category, with lots of diverse entrants, it’s very well done to Walton’s tower playhouse activity centre. 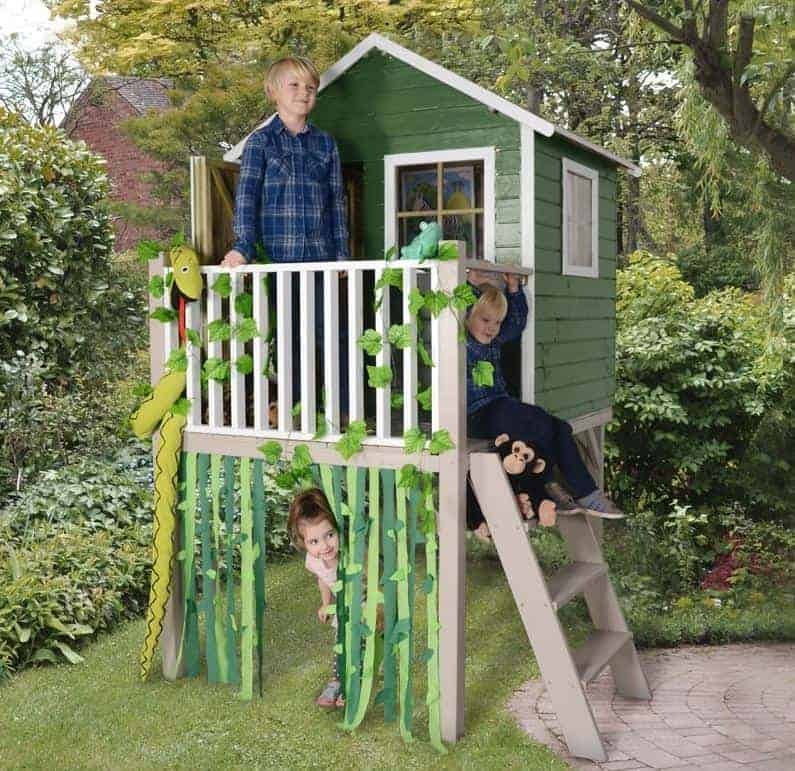 It has a huge amount to offer to children, and yet it still comes with an extended guarantee and a very affordable price tag; it’s this that earns it the top spot in our league table of the best kids playhouses that can be purchased online in the UK today. From playhouses to greenhouses, WhatShed bring you the independent reviews that can answer all your garden building questions. One of the great things about kids playhouses is that they come in all shapes and sizes, and all price ranges, so there really is something for everybody. This honeypot model, however, really does provide something for everyone in its own right; it’s more than a simple playhouse, it’s a multi level activity centre that’s easily large enough to entertain a group of three or four children at one time. 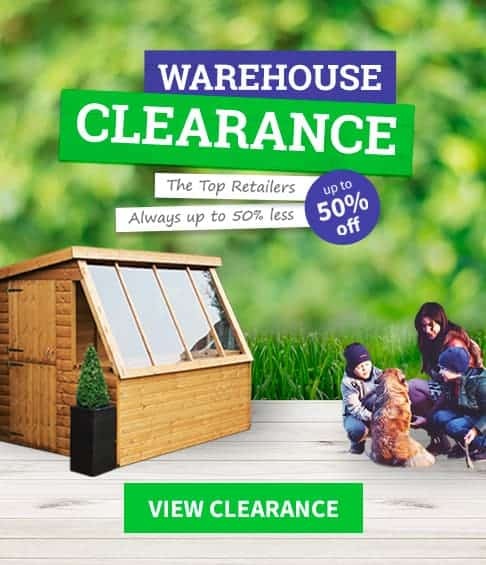 Considering the large base area of 4.03 x 3.71m we also think it offers very good value for money with its price tag of significantly less than six hundred pounds, particularly as it comes with a 10 year guarantee. When all these factors are added together this was a clear table topper in our list of the very best kids playhouses. From the moment we saw pictures of this playhouse we were impressed by its visual appeal, and by how much fun it offered to children. The main body of the playhouse itself is well built from smooth planed tongue and groove timber, and it’s on a platform which creates an extra shaded play area underneath. As well as the steps leading up to this platform, there’s a green plastic undulating slide on the other side. What makes this stand out visually from the other kids playhouses we’ve reviewed is that there’s also a swing set, providing lots of variety and lots of potential for fun. 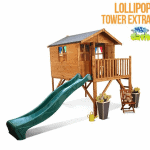 Well built and durable kids playhouses don’t have to be a strain on your finances, as this lollipop tower playhouse shows. It has a base area of 3.76 x 2.11m, and yet is available for an asking price of not much more than three hundred pounds. It also comes with a five year manufacturer’s warranty, giving added value to this already very affordable price. It’s this value that helps this good looking and well built kids playhouse into the runner up spot in our league table, and it provides lots of things for youngsters to enjoy as well. The green wavy slide was the first thing that caught our eye, and we can imagine kids getting lots of exercise as they repeatedly climb the steps to the balcony before sliding down on the other side. As with all the kids playhouses in our league table, it’s been built with safety in mind and meets all the regulatory specifications, but of course children will need to be observed when using any two level playhouse. We were glad to see lots of styrene windows around the playhouse, so there’s lots of natural light to read or play by. With a peak height of 2.32m there’s also lots of space underneath the playhouse itself, which can be used as a shaded den on a sunny day, or as an al fresco picnic area, with or without teddy bears. 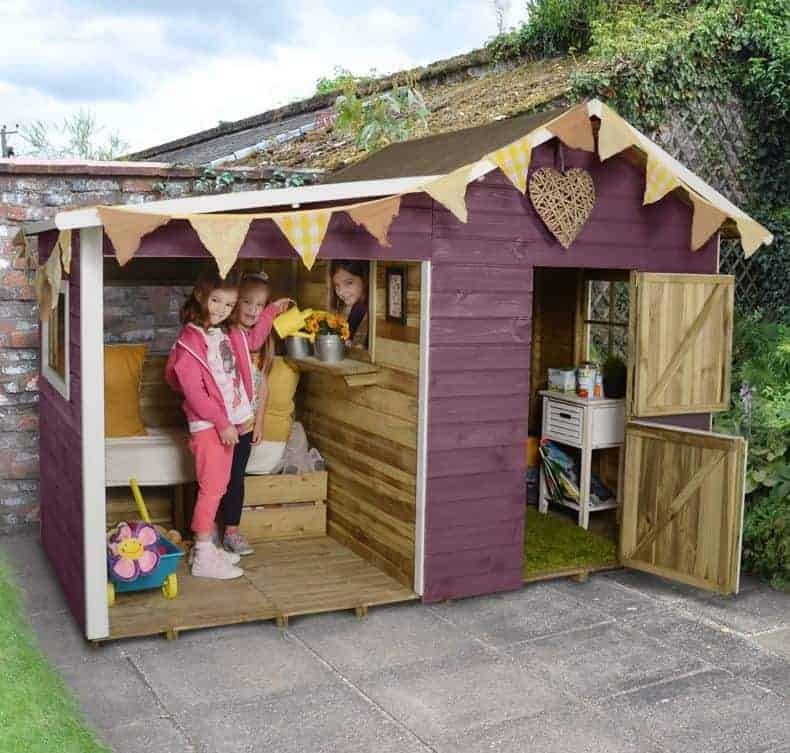 If you’ve got lots of space in your garden, and your children or grandchildren love nothing more than being outside having fun, then this could be the perfect playhouse and activity centre for you and your little ones. 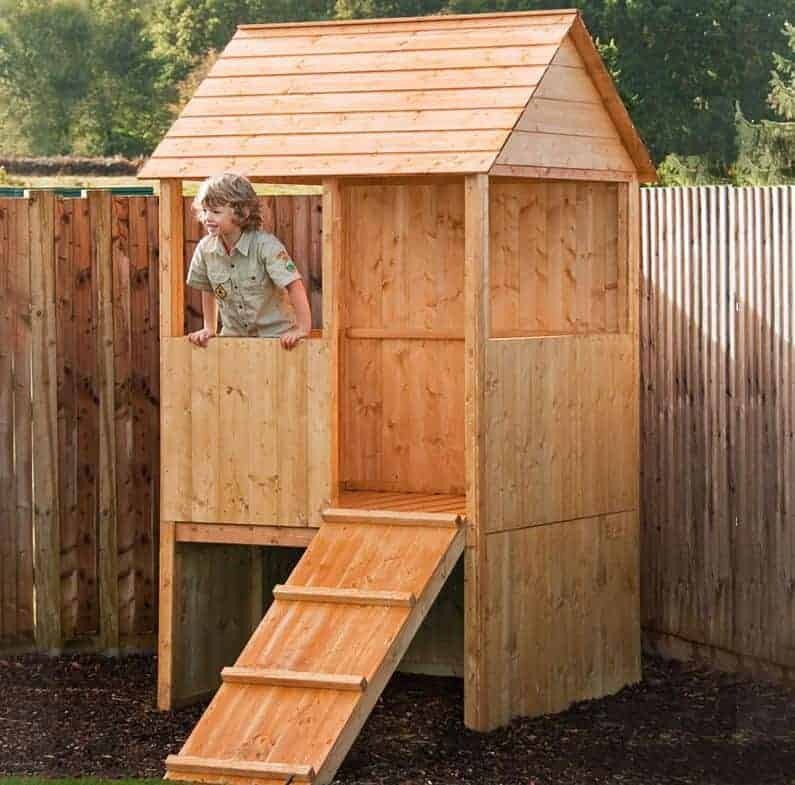 Put simply, this is larger than any of the other kids playhouses we’ve reviewed, being based upon an area of 5.82 x 4.77m, but that means that it has a lot to offer to youngsters as well, especially if they’re always full of energy. It’s also, however, by far the most expensive playhouse in our league table, and this is the only thing keeping it out of the top two positions. Nevertheless, if this falls within your budget then you may want to make it your number one consideration. In effect there are two tower style kids playhouses in one here, each of which offers an area large enough to play inside under the protection of an apex roof. Linking them is a rope bridge that kids will just love to cross, but of course it has been designed with safety as its top priority. There’s also a long crimson coloured slide leading down from one of the towers, for an extra element of fun and excitement. This is a playhouse youngsters are sure to love, but environmentally aware adults will love it too. That’s because it’s backed by the Woodland Trust charity who receive a donation for each sale made. We were also pleased to see that all the timbers had been pressure treated, and that they come with a 10 year warranty against rot. 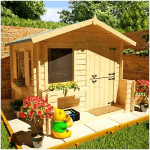 We’ve reviewed lots of BillyOh garden buildings in our time, from sheds to log cabins and workshops, and we were pleased to find that their kids playhouses keep up the high build quality and affordability that we’ve come to expect from them. In fact, this is by far the cheapest of all the playhouses we’ve seen that features a slide. This means that even those with a budget of around two hundred pounds can now put a big smile on their kids’ faces, and it’s this that gains it a position within the top five of our league table. Size wise this is based upon an area of 2.31 x 1.70m, but this includes the green slide that extends out from the tower playhouse itself. It isn’t the tallest or longest slide that we’ve seen on the kids playhouses we’ve reviewed, but this itself makes it a good choice for younger kids. The playhouse itself is based upon a traditional rectangular design with an apex roof above it. We found its classic looks to be pleasing on the eye, and when painted in bright colours they should appeal to youngsters as well. We were also pleased to find that tough tongue and groove timbers had been used for the walls, and that they came with a 5 year manufacturer’s warranty against rot. This Play-Plus playhouse differs from the kids playhouses that are above it in our league table for two reasons: it’s built on one level, and it doesn’t feature slides or swings. This means that it’s ideal for younger children, as it won’t require the constant supervision that a two level playhouse necessitates. Whilst it may not stimulate the body as much, this is very much a playhouse that’s designed to stimulate the mind, encouraging creativity and imaginative play; these are just as important in their own way as exercise is. 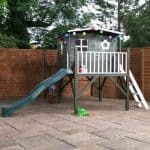 What impressed us most about this playhouse, however, is that all the timbers have been pressure treated, and this brings with it a 15 year guarantee which is as long as any that we’ve seen on a playhouse. It’s for this reason that it gains a deserved place in the top third of our league table. Style wise, this has a look of its own that we found very eye catching. An apex roofed playhouse takes up one half, while the other half is a covered verandah with an open front. Between the two there’s a connecting hatch, and the verandah section comes with integrated seating and a shelf. 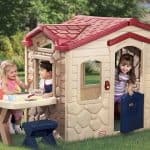 That opens up lots of play possibilities, and we can easily imagine these kids playhouses being used as a play shop, or maybe a pretend restaurant. 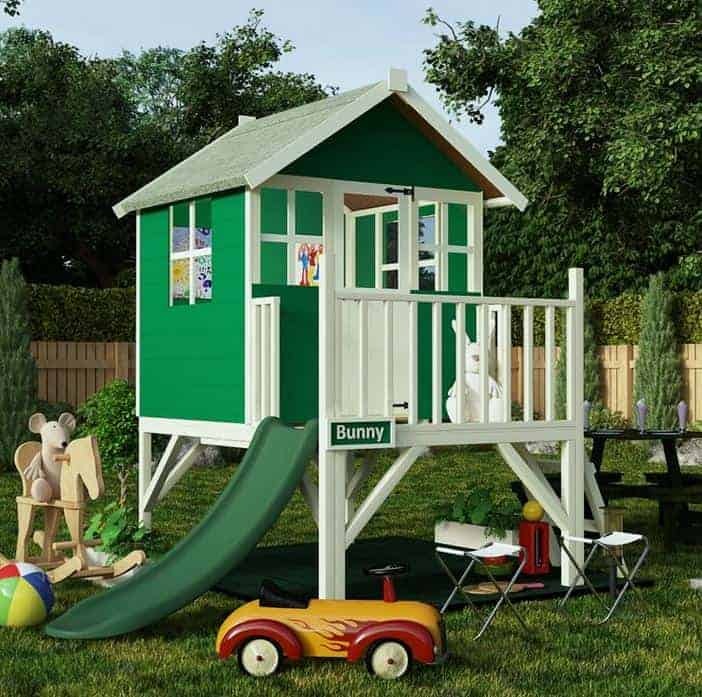 You’ll know how much your children or grandchildren love to climb up and down things if you take them to an activity centre, well these great value kids playhouses allow them to do that in your own garden. 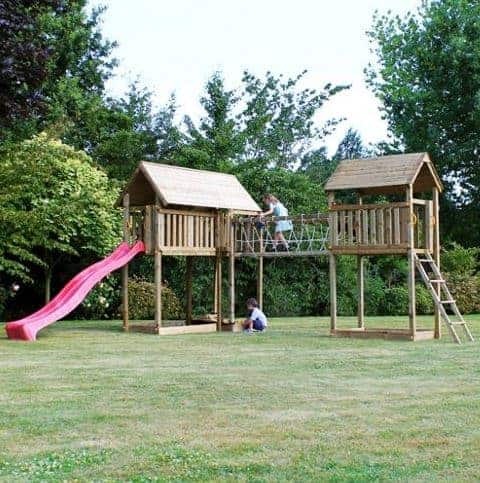 We always like to see well built tower playhouses such as this, as it effectively creates two play areas. On a cold or wet day, kids can stay inside the playhouse itself, and with a 1.25 x 1.75m base area there’s lots of room to accommodate their favourite toys and games. On sunny days they can venture outside and either look out from the attractive and secure balcony, or head down the stairs and play in the shaded area underneath the tower. With a peak height of 2.50m, this is taller than most of the kids playhouses we review, and at 1.02m the door height is a little taller too. This means that it can still be just as useful and popular as your children grow older. What impressed us most about this playhouse however was just how tough and durable it is. All of timbers have been pressure treated, and this gives a long lasting protection against rot, as demonstrated by the 15 year manufacturer’s guarantee. This also removes the need to retreat the timbers on an annual basis, which we feel makes this even better value for money. This is the first of the pre-painted kids playhouses to featured in our WhatShed league table, and it certainly caught our eye from the moment we saw it. This has been designed to appeal to girls, as it’s painted predominantly in a bright pink colour scheme, and it’s also been designed with fun in mind. Turning it’s back on the traditional rectangular shape we often find in the playhouses we review, this model has an offset apex roof that adds to its charm. We felt it looked like a fairytale cottage brought to life, which is sure to be a big hit with younger girls especially. We were pleased to find that these kids playhouses had a lot more to offer than their undoubted good looks as well. For starters, there’s a pink slide leading down centrally from the balcony area. There’s also lots of extra features that encourage creative play, from a chimney to a post box, a small blackboard above the door, and window boxes that flowers can be grown in. 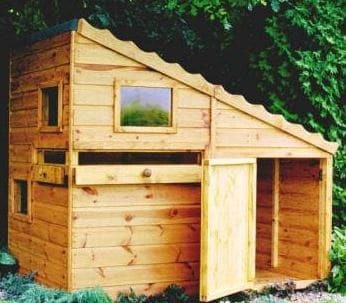 If you want a playhouse that’s quick to install and ready to use right away, then this could be your perfect purchase. It’s only the higher than average price tag and the lack of an extended warranty that stops this from attaining an even loftier position in our league table. Children have been playing at being soldiers since time began, but it’s only today’s generation that are lucky enough to have these fun kids playhouses to enjoy their games inside. It’s been designed to resemble a typical command post as seen in war movies, and whilst we found it very aesthetically pleasing even in its bare state, we can imagine it really coming to life with a coat or two of paint. It can be given a camouflage look, or an exciting array of bright colours so that your little ones can imagine themselves fighting off an alien invasion. With a base area of 1.79 x 1.19m there’s more than enough room inside these kids playhouses for two or even three kids, and the three fixed styrene windows allow them to look out at the garden, or maybe at the approaching enemy. What makes this truly unique however, are the two portals that can be opened, and from which children will love using water blasters or nerf guns. Be warned – you may have to take evasive action when walking past this command post! 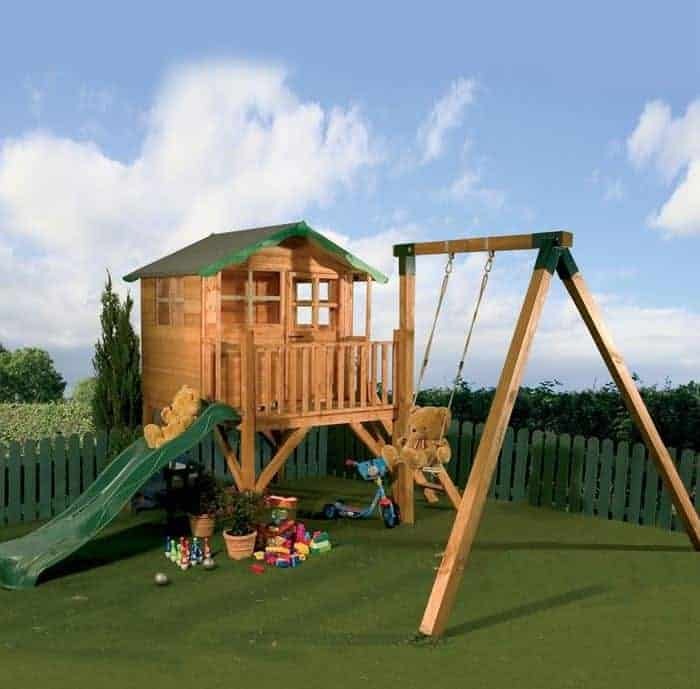 We feel this imagination encouraging playhouse represents very good value for money, and it’s only the lack of an extended warranty for the timber that stops it from climbing higher up our list. 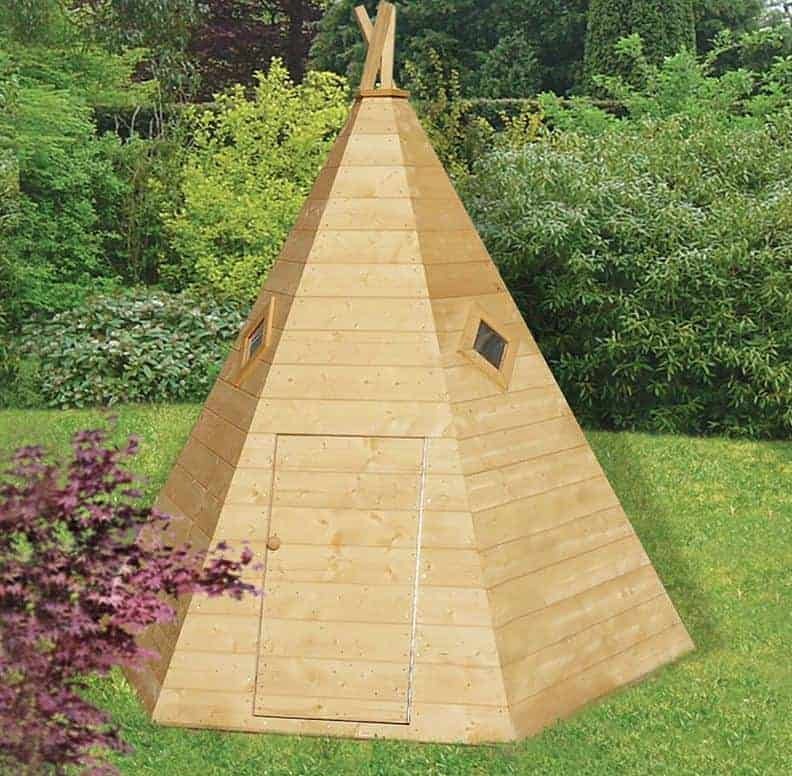 This has a unique form among all the kids playhouses that we’ve reviewed, in that it’s designed to resemble a native American teepee. That makes it one of the simplest playhouses we’ve seen, but also one of the most effective and visually pleasing. Supplied in bare wood, it’s a blank canvas waiting to be painted. When in suitably vivid colours, we feel this is sure to fire the imagination of any boys or girls who play inside it. It’s larger than you might think as well, with a base area of 2.04 x 1.76m, and with a peak height of 2.05m. A single door leads into the wigwam, and there are two diamond shaped windows higher up. These allow natural light into the interior, but it will always be shaded which makes this a more mysterious and therefore more fun environment to play inside. We were pleased to find that the timber has been dip treated and comes with a 10 year warranty as well, even though this is dependent upon an annual wood preservative treatment being added by the owner. 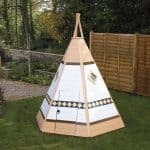 If your children or grandchildren love playing in tents, then this could be something more permanent and altogether more impressive for them to enjoy. One of the major benefits of well designed kids playhouses is that they encourage the imagination of children to take flight, and that’s one of the most important gifts that you can give to a child. This look out tower playhouse from Shire is a perfect example of that. 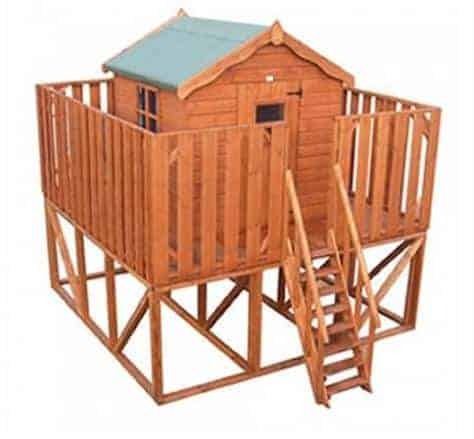 Structurally it’s quite simple, with a 1.20 x 1.20m playhouse being raised from the floor to create a second area that can be used for storage purposes or as a shaded den, with a ramp leading up to the playhouse itself. This simplicity is one of its advantages however, as your kids can project their own creativity onto it, and turn it into a look out tower at a battle, or maybe a fire station or railway station. There are many things that we like about these kids playhouses, one of which is that 12mm tongue and groove cladding is used for the walls, whilst 19mm solid boarding is used for the floors. That’s thicker than we find on many of the wooden sheds we review, and means that it will stand up to whatever your kids throw at it. We also liked the way that the entrance ramp has four horizontal struts, making it safe and easy to climb. The thing we liked most of all, however, is the asking price, which is cheaper than any other kids playhouse in our league table. Every parent has cherished the thought of putting their little angels behind bars for an hour or two at one time or another, and these fun and original kids playhouses allow you to do just that; and the kids are sure to love it as well. Designed to faithfully replicate the kind of lock ups you and your children will have seen in western films, or cartoons, this is one of the most visually striking playhouses we’ve seen. There are three windows, including the one on the single door, and they all feature wooden bars across them. There’s also a roomy verandah covered by a slatted roof, and even two horse rails in case the sheriff arrives with a posse. We found it very fun, so your little ones are sure to love it even more. 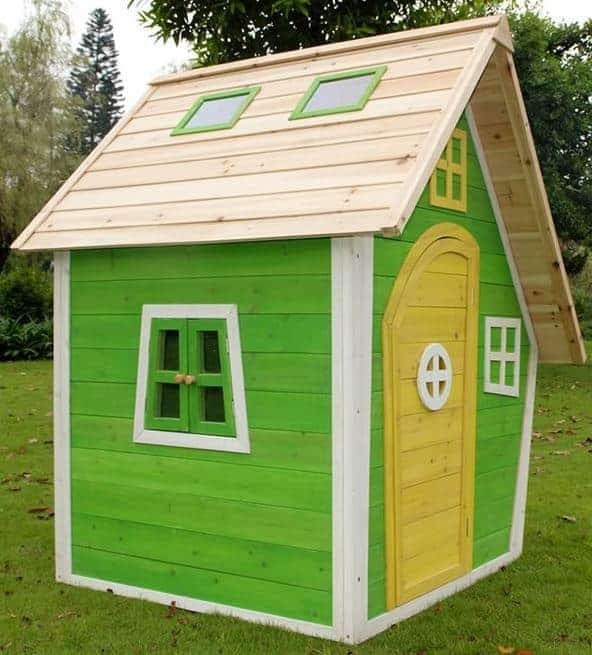 With a base area of 1.79 x 1.19m there’s lots of room available inside these kids playhouses, and so it’s an ideal all weather environment in which to play their favourite games or simply to use for an hour or two or make believe. We were pleased to see as well that the timber came with a 10 year guarantee against rot, which is a value adding feature that we always welcome. 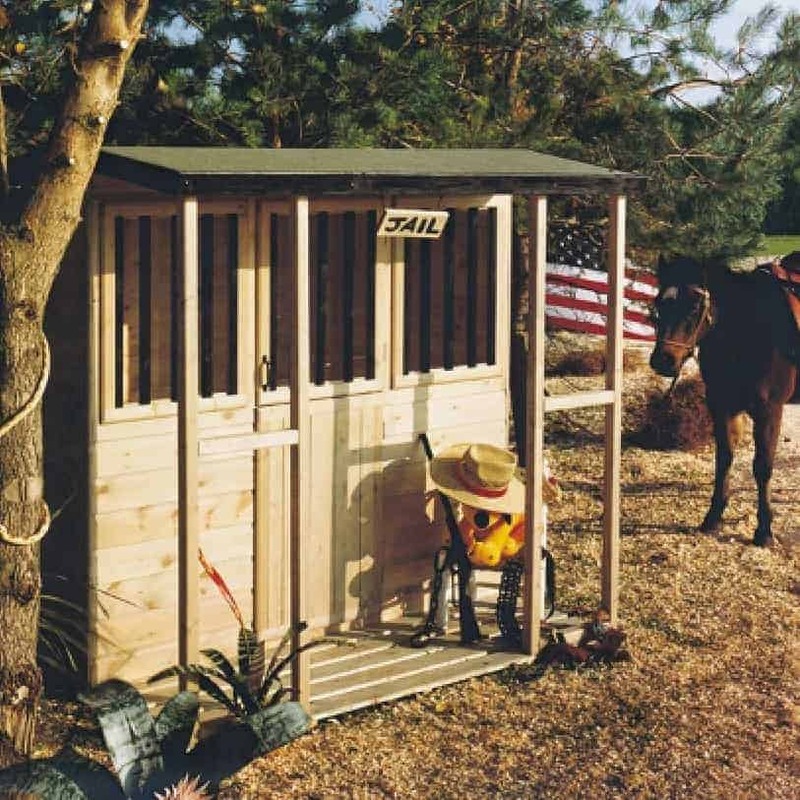 It’s not one of the cheapest kids playhouses in our league table, but if you have a child who longs to be a cowboy then this should be added to your shortlist. 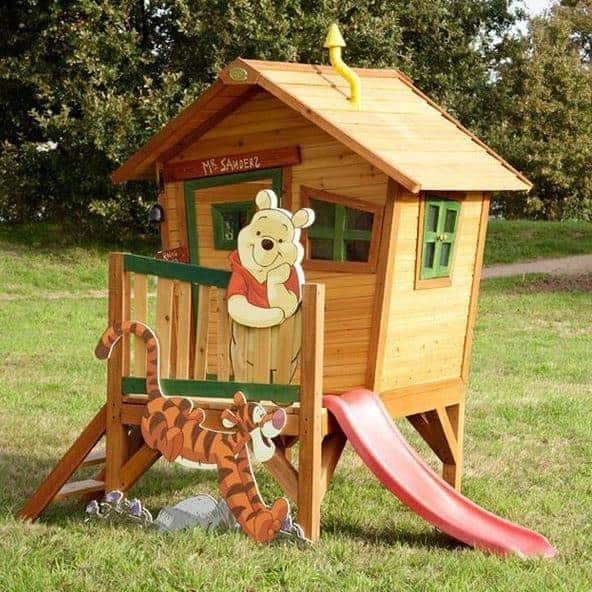 Axi’s range of kids playhouses are known for their radical and imaginative designs that put fun at the very forefront, and in our opinion this Winnie the Pooh model is the best within their range. It takes the traditional tower playhouse and then gives it an exciting twist. The playhouse itself has walls that lean out rather than being at right angles, and the roof is off centre. There’s a yellow chimney pot that’s bent in the middle, and all of the windows are slanting. We found it striking to look at, and as well as your kids being sure to love it, it can also become a talked about garden feature in its own right. Of course, the stars of this kids playhouse are Winnie the Pooh and Tigger themselves, who feature in wooden cut outs attached to the front. If your youngsters love these characters, then they’ll be delighted when they find this playhouse in their garden. It also has a maroon coloured slide running from the verandah area, so it’s ideal for even the most energetic kids. With a 5 year guarantee included as standard, and opening windows that are secured by magnetic catches, it’s only the elevated price which stops this from climbing towards the top of our league table. Wooden kids playhouses always look better when they’ve been painted or stained in bright, fun colours. Painting the wood also protects it from the fading effects of UV light, and adds an extra protective layer against rain. If you have a busy lifestyle, however, or simply don’t think that your painting skills are up to scratch, then this playhouse could offer an ideal solution, as it comes ready painted to a standard that we found very impressive. The bright yellow and green colour scheme will be very attractive to young eyes, but they’ll love the fun shapes all across the playhouse just as much. The door, for instance, is curved, with a porthole at its centre, and the side window is slanted rather than having straight lines. It’s features such as these that make these kids playhouses stand out from their competitors, and although it’s not the largest playhouse we’ve seen there’s still adequate room inside thanks to a base area of 1.02 x1.54m. If this had an extended warranty, then it could easily have earned a place in the top half of this WhatShed league table, but as long as annual wood preserver treatments are added by the owner we feel it should still prove to be durable and reliable. Extra fun and versatility is added to these classically styled kids playhouses by the adding of a front verandah area that leads to a slide. Unlike most other verandahs that we’ve seen on kids playhouses this one doesn’t feature a railing around it, so it will be important to supervise children using it at all times. 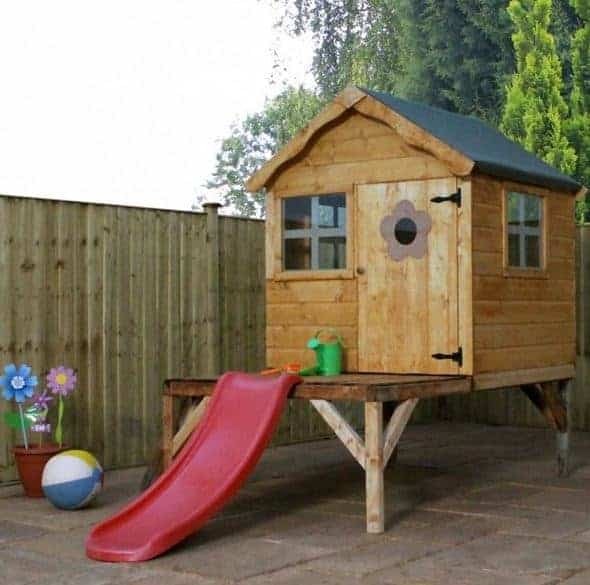 It is a relatively low platform however, although there’s still room for storage purposes underneath the playhouse, and we imagine that children will enjoy crawling under it and using it as a shaded den or hideaway. The playhouse has a base area of approximately four foot square, so whilst it may not be ideal for older kids, it’s ideal for those looking for kids playhouses that won’t take up too much lawn space. We are sure it will feel solid and sturdy once assembled, and that’s because it uses sturdy tongue and groove cladding for the walls. In conjunction with the apex roof it also keeps rainwater out, so you won’t have to worry about anything, or anyone, inside keeping dry. That also helps in the fight against wet rot, which is why the manufacturer has been able to provide a 10 year anti rot guarantee. One thing we particularly liked is the round window in the door, surrounded by wooden petals. It’s a fun feature, and adds to the visual appeal. If your children love to take part in imaginary battles, then these fortress style kids playhouses could be just the ticket. At the centre is a traditional rectangular playhouse, but it sits in the middle of a large platform with tall wooden railings on all four sides. The supporting structure underneath gives lots of space for children to play in as well, and emphasises the fortress like nature of this playhouse. It’s a unique look that differs from anything else we’ve seen, and for that reason it’s a good choice for people who want their children or grandchildren to be able to enjoy something special that none of their friends are likely to have. We were very impressed by just how solid and stable these kids playhouses are sure to be; they not only look tough, they are tough. That’s because they use 16mm thick tongue and groove cladding for the walls, which is thicker than we’ve found on any other wooden playhouses. It means that this is a playhouse that should last and last, whatever the weather throws at it, although an annual wood preserver treatment will need to be added. It’s only the lack of an extended warranty, coupled with the asking price of well over a thousand pounds, that sees this fill the final spot in our league table, rather than a higher one.